In 2007, the Comité sur l'immunisation du Québec (CIQ) recommended the establishment of a human papillomavirus (HPV) immunization program with the main objective of reducing the incidence of cervical cancer. In its recommendation paper, the CIQ pointed out the importance of measuring the impact of such a program and the necessary complementarity that should exist between the immunization program and cancer screening activities. However, it was not within the organization's mandate to issue specific recommendations regarding screening. The present recommendation paper is an extension of the CIQ's recommendations. 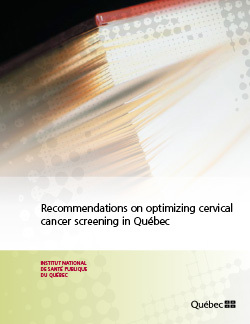 Its objectives are to clarify the relevance of cervical cancer screening now that vaccination is on its way, to document the current weaknesses in screening, and most of all, to identify the conditions, strategies and means to maximize the effectiveness and efficiency of cervical cancer screening in Québec. The analysis of current screening weaknesses was based on the model of Zapka et al., which describes cancer control activities according to a continuum of care, and on the results of a meta-analysis permitting an assessment of the relative importance of the main reasons screening fails. Potential solutions identified through a literature review were discussed and improved upon in small working group meetings. The recommendations proposed by the document's authors were then discussed in a meeting expanded to include representatives from various areas of expertise involved in cancer and its prevention (epidemiology, public health, obstetrics-gynecology, oncology, cytology, pathology, virology, primary care medicine, blood-borne and sexually transmitted infections, immunization). A first draft of the document was submitted for comment to all these stakeholders as well as to outside readers. This document constitutes an enhanced version with consensus reached on the recommendations it contains. The first part of the report reviews the key scientific data pertaining to the issue and examines relevant Québec data. The second part presents several potential solutions identified through a review of scientific literature and discussed with our partners. The third part includes the recommendations emanating from these discussions. The conclusion reiterates the document's key points and the commitment of the Institut and its partners to pursue the work required to implement these measures. To briefly summarize the recommendations: the top three recommendations address structuring measures such as the need to address screening according to a multidisciplinary, decompartmentalized approach to ensure direction in terms of cervical cancer prevention, to contribute to transforming the current opportunistic approach to screening into an organized approach, and to become equipped with essential tools, such as an information system so that evidence is used to evaluate and adjust interventions. Recommendations 4 and 5 directly deal with parameters for screening and monitoring abnormal cases that could be implemented in a first phase, and that apply mainly to women not vaccinated against HPV. More work is needed to define the optimal parameters for vaccinated women. Recommendations 7, 8, 9 and 10 cover various measures to improve participation, such as developing a procedure code to enhance the importance clinicians place on screening, improving access to screening services by having professionals other than physicians perform it, sending personalized invitations to women who do not take part in screening, and developing a public communications plan. Recommendations 11, 12 and 13 address support mechanisms such as providing training for professionals, introducing quality assurance measures, and conducting a periodic assessment of the results of our cervical cancer prevention efforts in order to bring about corrective measures when necessary.